Two common questions we get is what is manufactured home insurance and how is it different than regular homeowner’s insurance? Great questions here are the answers. 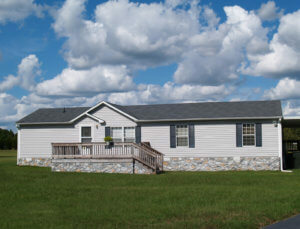 Manufactured home insurance is similar to home insurance that covers manufactured or mobile homes. However, there are several differences that while seemingly small, make a big difference when you go to purchase manufactured home insurance. First What is a Manufactured Home? To better understand this question two, we have to understand what a manufactured home is. Manufactured homes include single-wides, double-wides, park models, and all the variations in between. They can be on private property or in parks. Manufactured homes are built in accordance with code set forth by Housing and Urban Development (HUD), a part of the federal government. While similar mobile homes were built before 1976 and were not required to comply with HUD standards. There are several things that distinguish a manufactured home from a regular home is that they are not built on a foundation, but rather on a steel chassis. They are built in a factory and moved the site of the home mostly completed. The net effect of this several distinguishing features from a regular stick-built home. First, they depreciate or go down in value over time, rather than appreciate in value. Very important for insurance. Second, by their nature losses to the home tend to have a greater and tend to result in more total losses. In summary, manufactured homeowner’s insurance is like regular homeowner’s insurance, but takes into account several very important differences like the concept of depreciation. How is Manufactured Home Insurance coverage different than regular homeowner’s insurance? On the surface, it may not seem like there are many differences between Manufactured Home Insurance and regular home insurance. After all, both cover the home, your stuff, loss of use of the home, liability, and medical payments. Sometimes homes are even written on what’s called an “HO3” policy form which would make it the same. But there are some differences. Because manufactured homes depreciate you have to watch the valuation of the home. What does that mean? It means are you getting replacement cost, meaning the home burns to the ground you get a new home of “like kind and quality?” Or are you getting what it is worth today. For older home replacement cost might not be available. You need to know how your policy responds because most regular homeowner’s policies cover replacement regardless of the age of the home. Because of the depreciation what happens if it’s a partial loss. You want replacement cost for partial losses. Here’s what I mean. Hail storm destroys your roof. On manufactured homes policies you would get paid what the roof is currently worth rather than what it would cost to replace. So, a roof valued at 10,000 that is 10 Years old and has 20 Year shingles, you pay out $5,000 – minus the deductible. On the other hand, if you have full repair cost or replacement cost for partial losses you get $10,000 minus the deductible. Because of the nature of the HO-3 Policy form your stuff will be covered at actual cash value. Meaning in the event of a loss you might be left haggling with an adjustor. While this can happen on a regular homeowner’s policy too, this is something to look at. Personal Injury coverage is often not available. It usually can be purchased on a regular homeowner’s policy. There are more differences, but the differences are very subtle. Your best bet is to ask your agent if they understand the ins and outs of manufactured home insurance and make them explain it to you. At Gila Insurance Group we work with a number of specialty Manufactured home insurance companies and can provide better answers with answers to these questions. Call us today, or start your manufactured home insurance quote now! What does Manufactured Home Insurance Cover Who Offers Manufactured Home Insurance?